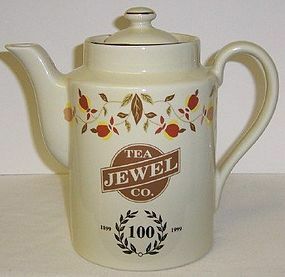 This is a really nice 1999 National Autumn Leaf Collectors Club-NALCC Autumn Leaf Jewel T 100TH Anniversary Washington Coffee Pot with Lid. This Coffee Pot also has a brief history of the Hall China Company on the back. Both the bottom and lid are in mint, unused, condition, in the original box. It is signed on the bottom MADE EXPRESSLY FOR The AUTUMN LEAF COLLECTORS CLUB by The HALL CHINA CO. 1999. Be sure to search our other Autumn Leaf items available. We guarantee all items to be as described. Feel free to email with any questions. THANK YOU.